There is some debate out there about the type of shorts to wear for triathlons like the Ironman competition and there seems to be a few distinct groups of people. Those who wear bicycle shorts, and those who wear triathlon specific shorts. Then there are the people who change between bicycle shorts and running shorts. Then there are the people who don’t like changing because it eats up time on the clock to change. Really what it comes down to is personal preference. Wearing cycling shorts presents a bit of a challenge because the padding is going to get wet after the swim and it doesn’t dry very quickly when you are on the bike. They can then also feel bulky and uncomfortable when running. So many people wear running shorts. But the problem with cycling in running shorts is that you risk some serious numbness after hours on the bike. So there are some challenges here. 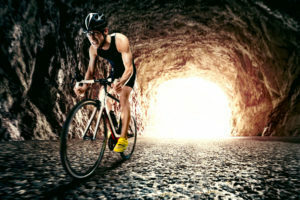 Luckily, there are triathlon specific shorts that are made just for events like Ironman and there are some great reviews out there by people who have actually tested various triathlon shorts on the race and come back with their reports. But you don’t have time to figure out what the best shorts are. You’re too busy training! So to make it easier for you, I’ve done the research on this and I’m bringing you the top rated, 5 Best Triathlon Shorts for Ironman.